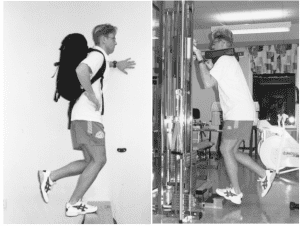 The truth is that all forms of resistance training are good for your Achilles tendon. There are two specific types of programmes that have the most research behind them. 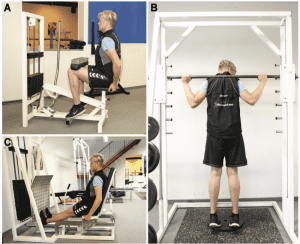 Alfredson’s eccentric (ECC) loading programme which can be done at home and a heavy load slow resistance (HLSR) training programme that requires access to gym equipment. Outcomes to both of these studies are very similar for a decrease in symptoms and return to function. However, the HLSR has better compliance rates as it only needs to be done 3 times weekly unlike the ECC programme which is twice a day, every day. So, let me show you both. Most people make their decision based on which is more convenient for their lifestyle. If you have any doubts, please get in touch with a health care professional. Standing on the edge of a step with your knee straight. Bring your bodyweight over to the affected side. 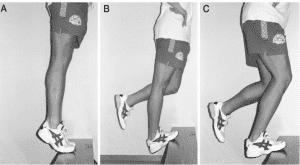 Counting down from 3 seconds, drop your heel down until you feel a stretch at the back of your calf/achilles. At the bottom, use your unaffected leg to return to your starting position. Do not use affected knee for this phase.